Title (ownership certificate) ~ this must be in our consignors name unless you are a licensed dealer. California Smog Certificate for all vehicles 1976 or newer (must be dated within 60 days of the auction). As you have probably already learned, placing your car in the local paper for several weeks can add up to big money...hundreds of dollars. And nine out of ten people we talk to never get the kind of response they thought they would. It's too much and sometimes aggravating to sell your car privately and no matter what price you ask, your offer will always be less than you are asking, that's where the auctions come in. Here you are not just dealing with one buyer but multiple buyers all competing for your car and your offers go up...that is how you get the most money. But not all auctions are the same. For over 30 years, Keith McCormick has established a very successful auction based on integrity, honesty, and total dedication to one thing: CARS! 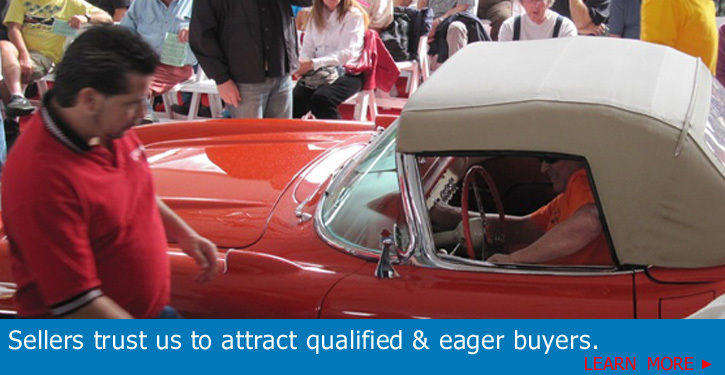 For buyers, that means having confidence in the cars, your bid, and the entire transaction. For sellers, it means knowing that you'll get the best price and get paid. The cost of putting on a high class auction the way we do it is close to $300,000 each sale. The major expenses are advertising including printing, radio, and television, actual printing including color brochure, bulk mail out (over 18,000 pieces each mailing), hotel rental, set up, fence, PA system, security guards, tents, golf carts, close to 120 staff on sale days etc. Permits, insurance, phones, office expenses and last but not least our auction crews wages. So our entry fee is really a great value. YOU MUST REGISTER at our website, by phone, or by mail. Keep in mind that our commission rate of 6% (the lowest in the business) will net you the most money for your car. If you have any questions about consigning your car, please call us for information. Consignment Form: Read the back of the consignment form carefully when you request one and know the terms of the auction. Complete the form in full, or as best you can. Be true about your car! Rate the condition of the car one step down, as a rule, from what you think that condition is. Be sure to SIGN the form in the appropriate place. Sellers fee is 6% of Sale Price (minimum $100). Documents for Entry: A copy of the title MUST accompany the consignment form. The ORIGINAL title documents are required at time of check-in. NO EXCEPTIONS! A NEW CALIFORNIA SMOG CERTIFICATE IS REQUIRED for all American and European cars 1976 or newer, and MUST accompany original title upon check-in at site. The serial or V.I.N number is critical and the vehicle must match the title, please make sure you know where you V.I.N number is located on your vehicle. If not, your car will not be allowed in the auction nor on the grounds during the auction. Liens or Encumbrances: Vehicles with liens CAN NOT be sold at our auctions. Due to delays in processing paperless titles and vehicles with bank pay-offs to new buyers. We cannot accept entries without a paper title. If you arrive at check in desk without a title we will not accept the entry. At that time no lot # refunds will be issued. Pictures: Pictures play an essential role in selling your car. The keys to great photos are composition, quality, and size. If you're planning on e-mailing us the photos, send them to jason@classic-carauction.com and be sure to include your lot #, year, make and model of the vehicle in the e-mail. If you don't have digital shots and have to mail us actual photographs, we prefer color prints in 4 x 6 formats. Polaroid's will not do! We can display up to 12 images on our web-site, including both exterior and interior shots. Note: OUR CATALOG PHOTO DEADLINE IS ABOUT MONTH BEFORE EACH SALE AND ONLY THE FIRST AND NICEST 160 PHOTOS RECEIVED WILL BE USED. 75% of cars pictured in our last brochure sold. Increase your chance - and send us your photos. Number System: Each consignment is given a sale rotation number in the order received. In other words, the earlier the consignment is received, the closer to a prime time (mid- day) number is awarded. PRIME TIME LOT # positioning is between 11:30 to 2:30 on either day. Buy your number early to get the best time. "CONSIGN EARLY". Autos sell in the auction at the rate of approximately 20 per hour. Cars #1 through #180 are Friday night, #181 through #405 are sold on Saturday; cars #406 through #580 are sold on Sunday. Keep this fact in mind when considering the selection of your sale number. CONSIGNMENTS RECEIVED BY MAIL ARE GIVEN THE BEST POSSIBLE SALE NUMBER AVAILABLE.